Posted April 14, 2016 12:42 PM by Benjamin De Maar. 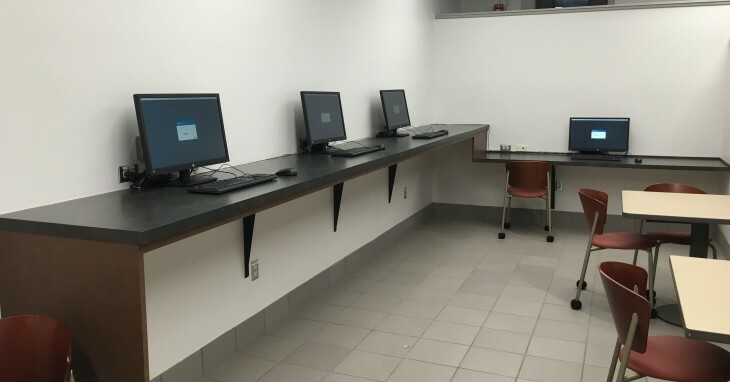 Four new open lab stations offered by ITS in the newly remodeled Northbank Center basement. ITS is happy to announce that we now offer 4 open lab stations in the newly remodeled basement of the Northbank Center. In addition to the new computers, ITS is also looking into adding a printer to round out the area. The stations are conveniently located next to Simply To Go and are available to all students/faculty/staff. If you have any questions, please let us know by phone at 810-762-3123 option 1 or by email at itshelpdesk@umflint.edu. To view our additional open labs on campus, visit our open labs page on the main ITS website. Not sure where Northbank Center is located? Visit maps.umflint.edu for location and directions.